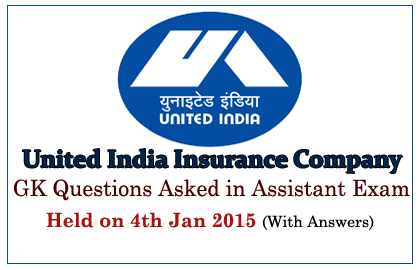 List of GK Questions Asked in United India Insurance Company Assistants Exam held on 4th January 2015 with answers. Candidates those who are preparing for Banking and Insurance Exams can use these questions to develop your knowledge. Ganga River was originated at? Recent G-20 Summit was held at? Who is the author of the book- “The Immortals of Meluha”? Dadasaheb Phalke Award 2014 was won by? What is the Highest Sports Award in India? Who decides the rate of interest of savings accounts? In Public Sector Banks, what is the minimum shareholding of the government? Name the Indian who won the China Open Men’s Badminton title recently? US Open 2015 Men’s Single was won by? Recently, Where does Narendra Modi opened Mahatma Gandhi’s statue? Who won the Arjuna Award 2014 for Boxing Discipline? What is the minimum income for e-filing (Income Tax)? India and _____ has agreed for the 900 MW Arun III project in Arun River? What is the Headquarters of World Bank? Recently India has won the Hockey series against Australia in the margin of? Who recently won the International Children Peace Award? Bhavanisagar Dam was located at which state? Who is the ambassador for Cricket World Cup 2015? What is the Currency of Denmark? What is the minimum cash adequacy ratio for small banks? What is the Lock in period under Rajiv Gandhi Equity Saving Scheme (RGESS)? Who is the Present Union Minister of Law and Justice? What is the name of the code that present in the Cheque?